WCBAA will once again host the annual Winter Classic. Entry fee includes “Coffee and Rusks” and “Boat Ice” in the mornings on both days of the tournament. that will be prepared by Marius Nel. Please ensure you attend the briefing to obtain all the details. 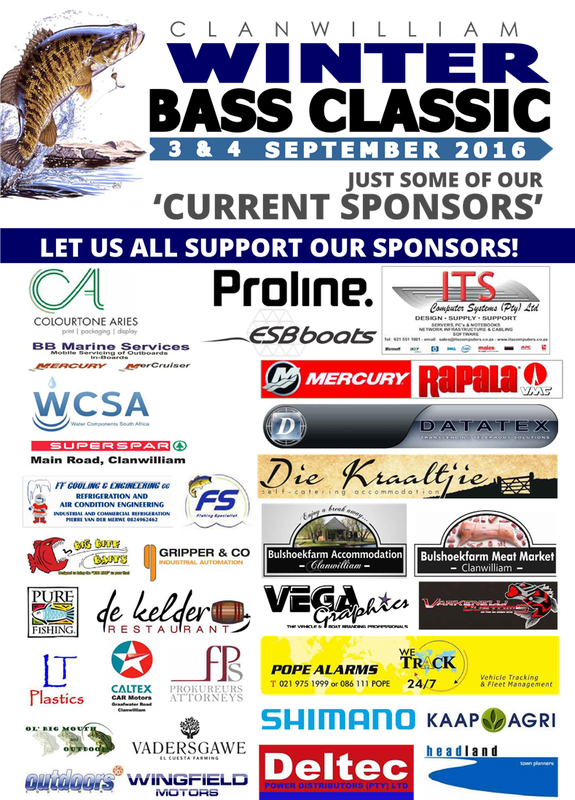 Friday 2 September from 17h00-20h00 all anglers to register. The briefing will follow at 20h15. REFERENCE:Please use your “Team Name” as reference. Entries will be accepted until 28 August 2016. Late Entries are welcome but will carry an additional of fee of R100 on the entry price (Total R1600). If you are going to pay at registration please still send your entry forms through in the interim as this will allow us to facilitate for the correct quantity of seating etc. for the Saturday meal. Please enter as soon as you can. The person entering this competition as guardian hereby consent to such minor being bound by the a foregoing and further indemnified the organizer and aforementioned parties to the extend, if any, to which such minor is not capable of waving his/ her right as stipulated above. I agree to participate subject to the waiver. A team will consist of 2 anglers and only teams will qualify for team prizes. Maximum of 2 anglers per boat. Only competitors may occupy boats. All fish weighed will become the property of the organisers and will be released. Prize winners must PERSONALLY collect their prizes, which will otherwise be forfeited. Only artificial lures may be used. Only one rod may be used at a time per angler. SAMSA regulations will apply to all vessels. WCBAA rules will be applied. All anglers must attend the briefing. PRE-TOURNAMENT PRACTICE - Absolutely NO fishing after sunset on the 28th of August 2016. Safety - Safe boat conduct must be observed at all times. Lifejackets must be worn anytime the combustion engine is operating. SCORING - Tournament standings, auxiliary awards and final winners shall be determined by the combined weight of each team over the two days. Only bass will be weighed. The limit shall be 5 fish per team per day. Starting positions will be drawn at registration. The Heaviest Fish of the tournament will be eligible for ONLY one prize.